Well! talking about stress is a part of the daily routine for the Americans. The stressful situation adds flavor to our life. I know you may misinterpret my statement but it's fact. Most of us are searching for a reason to get stressed. Though our present is good still we are getting stressed by bothering about our future. Sometimes, we also get stressed by bothering about our past. Anyways, today we are gonna talk about the stress in our present day. I have seen people criticising 9 to 5 job whenever they get chance but unfortunately, no one talks about the benefits. A job gives an individual a financial stability, insurance for the family and many more things but the downside is the stressful situation that needs to be encountered on a day to day basis. So, if we deny the existence of stress at work, that is, job or business, then it will be lying to ourselves. Though there is a long list of the negative impact of stressful life still it has some positive aspect as well. Handling stressful situation on a regular basis makes you mentally strong and the experience that you gain in this situation can be of great help in future as well. Needless to say, we can learn stress management techniques to cope with stress effectively. There are three aspects of a stressful situation. Scenario before a stressful situation. Scenario after the stressful situation. In case, you are in a job where you need to face an extremely stressful situation on a regular basis, then it's better to prepare yourself physiologically, psychologically, and emotionally for the ill effect of stress. We will be discussing a scenario for the better understanding of the topic "how to handle a stressful situation at work?" Project Deadline: You are the manager of the project and your team has not been able to deliver the project on time. Though client gave you time extension twice still your team couldn't deliver. Now, it's your time to face the client and manage to retain the project. You also know that the probability of losing the project is very high. So as a project manager, you are well aware of the fact that the scenario is gonna be tensed and there is very little that you can do. You have to take the responsibility for failure as the captain of your team. Step 1: This is time before the stressful meeting that you have to face tomorrow. So, you have to be relaxed, stay focus, and look for the best that you can do. Simply, thinking about the tomorrow can make you tensed and hopeless. So, the best thing is to remove the negative thought from your mind and be optimistic. List down all the reasons for not delivering the project on time with the proper explanation and explain the same in the meeting. Also, prepare a set of answer for the objection handling, that is, the set of questions they may ask according to you. If you have time, then do some online research and find out the ways people have dealt with the similar situation in the past. Step2: Trust me, Guys, this is the time when you have to put your experience on a run. Be patient and listen to the client. Needless to say, there will be an element of anger and frustration, the success of the meeting totally depends upon the way you handle their query. Remember to back your answers with data. For example, if your team couldn't complete the coding of an application in the project, then it's important to also highlight the number of attempts made by your team and the list of problems they faced during the entire process. According to me, trying to convince the client will not be a better option rather being true and highlighting your team efforts and the success that your team achieved may be of great help. Be confident and don't raise your voice while answering their query. It's a business meeting and it may be possible that things aren't working your way. So, in that case, you don't have to lose your cool. The best thing you can do is to answer their query politely with a logical blend. If you are feeling stressed out, take a short break from the meeting. Have a glass of cold water and breadth deeply for a few minutes before starting the meeting again. By doing so, you can reduce your stress level drastically. If the situation is getting out of control, request your client for a next meeting. In case you have forgotten to come with some answer or data that the client is looking for, don't get stressed, request them to share their details and mail them once you are back to the office. Though the things that I am talking about are smaller ones still most of the people forget these basic things when they are exposed to a stressful situation. If you have a prior experience of handling similar kind of stressful situation, then definitely you will have an added advantage. Remember, you aren't gonna lose anything in the meeting, either you will win the project back or you will earn an experience. Last but not the least, your body language should be perfect. You should feel very confident while tackling each and every query of the client. There can be instant when you don't have the proper answer for a particular question, in that case, don't try to bluff the client, rather ask for some more time so that you can come up with the best answer. One important I forget to talk about is the mindset. Trust me, your mindset plays a crucial role when it comes to answering a query or reflecting your body language. Be positive and optimistic. Even things are against you, don't lose the hope and patience. Every query of the client should be handled with a motive to get the project back. Highlight the competitive advantage that you have over your competitors. For example, the kind of clients you have handled in the past, the expertise of your resources, bench strength and so on. If possible also go with the SWOT analysis of your client. Make them comfortable and try to take them into your confidence. Don't hide your team and company weakness, better highlight the steps you are taking to improve the performance of your team. Always highlight the strength of your team. One alternative solution is to prepare a case study on the entire project and discuss the same with the client. By doing so, there is a huge probability that you will do a good job. If there is a learning curve for the project, then highlight it to the client. For example, explain to them the minimum amount of time that will be needed to learn the basics of the project, in case the project is giving to any other company. Step 3: Once the meeting is done, thanks to the client and don't forget to request for a feedback. No need to take a rigorous follow-up every day. Wait for few days and then drop a message asking for the feedback. If you get a negative feedback, then ask for a meeting. Before going for the meeting, work hard on your strength and be well prepared for the weakness. Already you have an experience of the stressful meeting, so there is no doubt that this time you will be more confident and prepared. Remember, if you get an opportunity to meet them, definitely it's a good chance that you will be able to get back the project. Don't go with the redundant answers, rather prepare some out of box solution. If you are able to answer their query in an innovative way, trust me, you can win the project back. Before we discuss some other methods of handling stress at work, let's have a look on some of the hand-picked articles. How to destress after work? How to manage stress in life? You need to have a balance between the good and the bad stress at work. The best part about the good stress is that it will keep you motivated and productive. Learn to react to the situation and Not the stress. By doing so, you will handle the situation without being stressful. For example, In a stressful situation if someone is yelling at you, don't reciprocate rather dig into the reason and counter attack the person with the solution. Learn the basics of the stress management and coping stress at work. Learn to give your best under stress and get the work done. You can also take help of your colleague who has performed extremely well under stress. Stay calm and patient under stress. 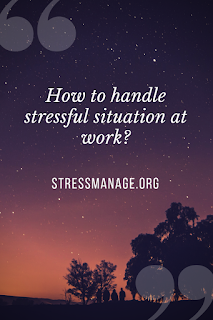 [Bonus Tips]- How to handle a stressful situation at work? Be well prepared: You need to be well prepared for the unexpected events. The more you are prepared the better you will deliver. For example, train your subordinates to handle the stressful situation. Always have an alternative for events like a computer crash, power failure etc. Don't forget to have a backup for the top performing and crucial employees. If anyone of your top employees is absent without prior intimation, then by using your back up the task will run smoothly without any hindrance. Take care of yourself: Being mentally and physically fit always gives you an upper edge when it comes to dealing with the stressful situation. Keep a track of your health condition and inculcate good habits in your daily routine such as eating healthy, taking meditation classes, not overstretching on a regular basis and so on. Always maintain a healthy work-life balance. Calm down: In case of a sudden encounter with a stressful situation, avoid overreacting and try to recall if the similar situation you have handled in the past. Breadth slowly and deeply. Think Positive: Though the situation may be extremely stressful still be optimistic and think positive. Rather than reacting instantaneously better respond to the situation after figuring out the best possible solution. Make a plan: To deal with the stressful situation, list down all the probable solutions. For every solution, figure out the positive as well as the downside. Then, jot down all the solutions by assigning a priority to each solution depending upon your set parameters. By doing so, you will have multiple options to deal with a stressful situation. Take Action: Once you have a plan, take action at the appropriate time. Delay the action can further aggravate the stressful situation. Trust your experience: When you are handling a stressful situation, trust your intuition and try to correlate the situation with your past experience. Listen to everyone but take your own decision. Connecting Dots: Try to connect the dots. When handling a stressful situation, try to find out the missing information. Remember, there is very less probability that decision taken on partial knowledge will be a great decision. So, jot down all the points and then check if you have all the needed information. Once you are equipped with all the necessary inputs, take the decision. 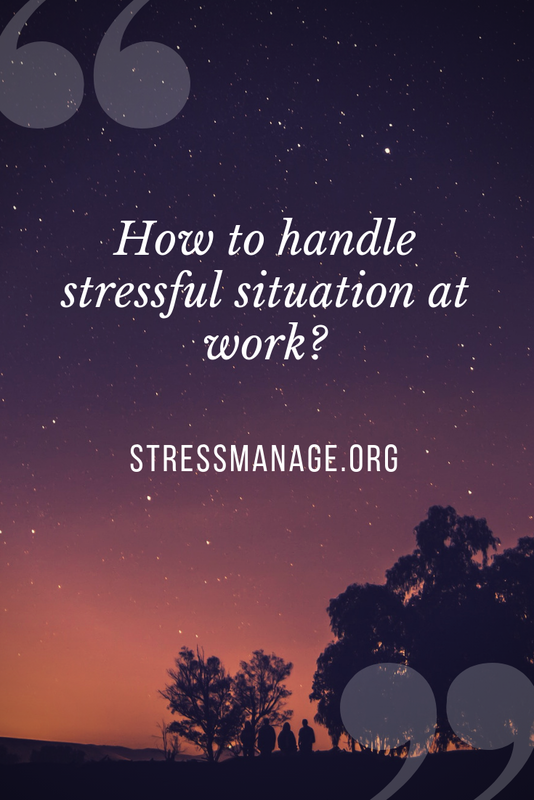 Wrapping UP: I hope this post will definitely help you to handle a stressful situation at work. By following the simple steps mentioned in this post, you can handle the stress in a better way. In case we have missed some points, please mention it in the comment section.